Located in the heart of laid-back Vientiane, minutes from the Mekong River and surrounded by an array of restaurants, shopping centers and tourist attractions, City Inn Hotel is the perfect choice for your stay in the capital, whether visiting for business or pleasure. Our hotel is a subtle blend of contemporary design and Asian culture, with a variety of comfortable and tranquil rooms, which reflect the unhurried nature of Vientiane, one of South-East Asia’s most relaxed capital cities. Our facilities include air conditioning, cable TV, complimentary in-room wireless internet, laundry service, restaurant, buffet breakfast and traditional massage, while we also offer airline confirmation and transfer to and from the airport. 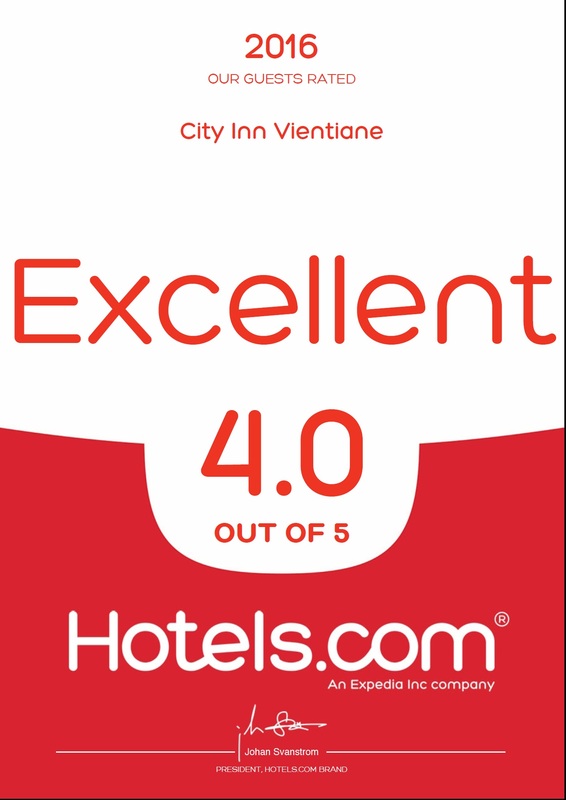 City Inn Vientiane is also leading the way in environmental responsibility within Laos’ hotel industry. We are committed to run with as little environmental impact as possible and have introduced measures such as the installation of energy saving LED lights within the hotel and eliminated the use of disposable in-room shower gel and shampoo bottles, saving almost 50,000 units per annum. In future, we hope to make even greater progress through our green initiatives.